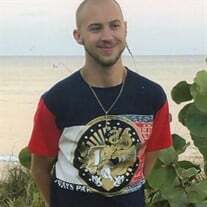 DeVries, Brandon Scott, age 28 of Palm Beach County, FL and formerly of Blaine, MN passed away January 28, 2019. Brandon was kind, loving, polite, generous, outgoing, with a great sense of humor and a smile that would light up a room. Survived by parents, Scott and Colleen; brother, Taylor (girlfriend Chelsea Schriever); grandparents, Al and Diane DeVries, and Vicki Williams; great-grandma, Dorothy Arneson; aunts, Dawn (Tom) Skwarek, Marcia (Mike) Barnes, and Rhonda (Bruce) Ringkob; many cousins, relatives, and friends. In lieu of flowers, memorials preferred to Minnesota Adult & Teen Challenge. Memorial service is Saturday, February 23 at 11:00 a.m. with visitation one hour prior at Salem Covenant Church, 2655 5th St. NW, New Brighton, MN 55112.